Since we mums spend so much time watching, singing about, helping to colour in, and picking up soft toys of cartoon characters, they can sort of take over our lives. The other day I even found myself thinking, “You know, I’m just like Mummy Pig”. For months now, Daisy and Poppy have been obsessed (with slightly worrying stalker tendencies) with Peppa Pig. They only get half an hour TV a day, but it has to be Peppa. 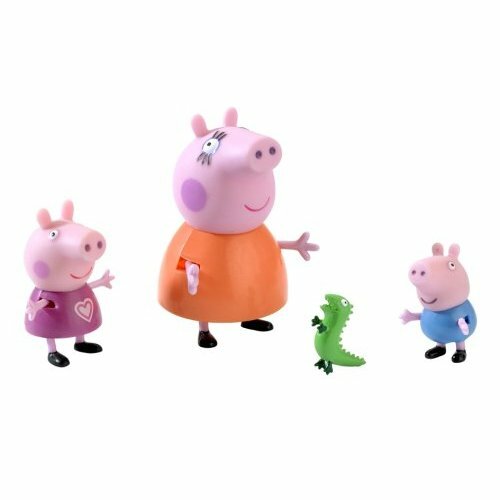 All they will play with are Peppa Pig characters…. and since the family have pretty much moved in with us, I feel like they’ve become us. Or us them! Certainly Mummy Pig is worryingly like me. She constantly tells Peppa she “has important work to do on the computer.” Ahem. Sounds a lot like me. The great thing about Peppa is that Daisy now respects my work as something very important. I was writing my blog the other day and I could hear her tell Poppy, “Leave mummy alone, she has important work to do on the computer.” I gave them an extra episode that day! Mummy Pig is the voice of reason in the midst of mayhem, and I like to think I bring a little calm to the chaos…… (I’m hoping my hubby doesn’t read this one…). Mummy Pig is kind and loving, and smart and intuative, a great mother, a lovely wife, a worker, a warrier, and I find myself smiling when I hear her hamming it up, bringing home the bacon, and fixing whatever pig’s ear Daddy Pig has made of things. And so it has come to this. I used to aspire to great women – Virginia Woolf, Kate Adie among others. And now? I’d be happy to live up to the moral code of a pig. Mummy Pig. Honk honk. Forget Swine Flu, I have Swine Envy. What children’s character are you??? This entry was posted in motherhood, Mummy Pig, Peppa Pig. Bookmark the permalink. 7 Responses to Which Cartoon Character are you? I LOVE this post. how funny, how we change when we become mums. Mummy Pig, huh? i will have to think about what i am, even if my 2 year tells me i am Mummy Bear from the Goldilocks story. i still want to be maria from sesame street. we don't get peppa pig here, at least as far as i'm aware. but it sure would help my 'work' if we did! This is so funny. Unfortunately for me it's going to have to be a Tombliboo after too much choc over Christmas! Mmmm, another reason I'm like Mummy Pig – she loves chocolate cake! Not sure about *me,* but my friend just told me today that Elmo always reminds her of my son! (Cheerful, friendly, squeaky, always up for a party).